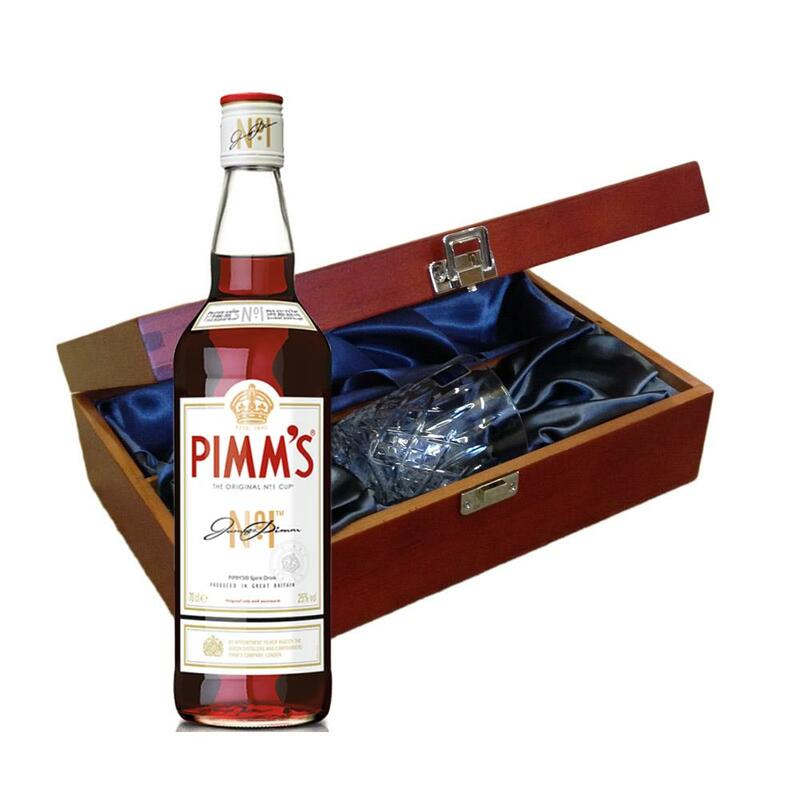 Send a bottle of Pimms No1 70cl wine in a lovely box beautifully stained featuring traditional joins with hinged lid and clasp fastening. Along with a beautiful hand cut lead crystal Royal Scot glass. All gifts come with a gift card with a message of your choice. Pimms No1 - Nothing beats a glass of Pimms on a summers day. The British beverage is almost as much a tradition as the cup of tea and the British down the gin-based drink by the gallon during the summer months. History of Pimms Rewind back to a London oyster bar in the 1840s where owner James Pimm invented the thirst-quencher. Using gin quinine and a secret mixture of herbs good old Pimm served up the brew as an aid to digestion dishing it out in a small tankard and the No. 1 Cup moniker was born. After the Second World War Pimms extended their range using a number of other spirits as bases for new cups. Scotch lent its name to No. 2 cup while No. 3 used brandy No. 4 rum No. 5 rye and No. 6 vodka. Of these sequels the vodka cup and brandy (now called Winter) are the only ones in production while original No. 1 cup still reigns supreme in popularity. This product is hand packed onsite by Gifts International, and is not affiliated with any other brand. Gifts International is responsible for this product combination/set.